I recently came across this on the web. 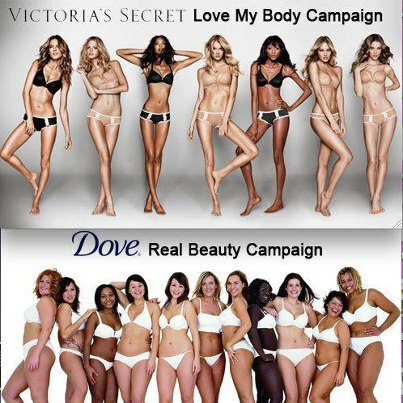 As for Victoria Secret....need I even comment? There's a reason why they are modeling agencies who have to comb through the nooks & cranes of the world to find these women because the average woman does not look like this....and yes even for the ones that have healthy lifestyle habits....it is part of their jobs as models to maintain a certain size. Its part of what they get paid for. Their body is their JOB. So How do I feel about this picture? I'm indifferent to it...because I am aware/educated on their reality of what these images represent. My biggest fear with the Real Women Have Curves movement is that some people use that as an excuse to not address the health risks with being over weight. Or to deny even being over weight. Or misinterpret it to mean...FAT is ok.
You can be a real woman with curves BUT make sure you have good BP, Triglycerides, Cholesterol, % Body fat, BMI, LDL, HDL numbers. So in conclusion, it doesnt matter how big, small, skinny, or "curvy" you look....What do your numbers say?